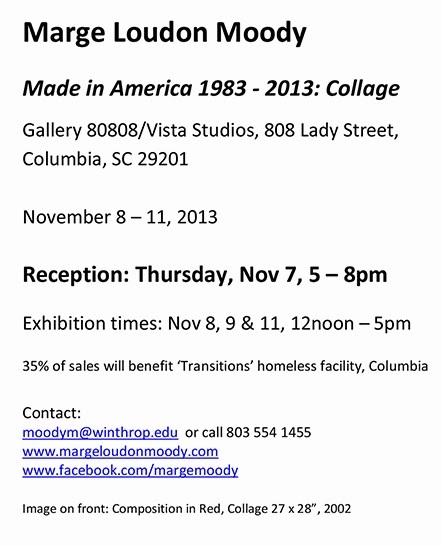 In the final exhibition of several shows held this year celebrating her 30-Year retrospective, artist Marge Loudon Moody will be displaying some of her graphic work in an exhibition entitled Made in America; 1983 – 2013: Collage, at Gallery 80808, Vista Studios, 808 Lady Street, Columbia, SC, 29201. The opening reception is Thursday, Nov 7, 5 – 8pm, and the exhibition, which is free and open to the public, runs through November 11. As in previous shows, 35% of sales will benefit the homeless – in Columbia, ’Transitions’ Homeless facility. Moody’s artist statement reads: ‘My work is inspired by the spirit of place. 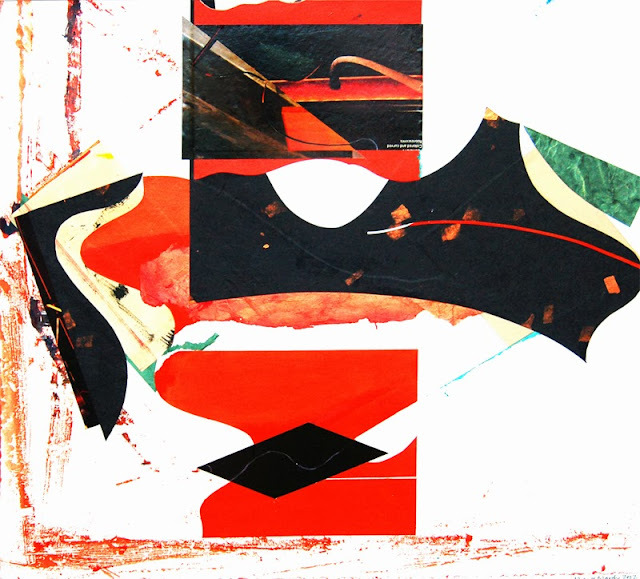 I make abstract acrylic paintings on canvas, collages and mixed-media pieces, which, through a rigorous process of working and reworking of composition and art elements, arrive at a harmonious expression of the essential nature of the subject. My collage work often employs ‘found’ materials and involves layering and precise juxtaposition of line, color, shape and texture. Life experience may be similarly layered. At times, subject matter serves as metaphor for intangible ideas. It examines boundaries, and addresses the fragility of existence, of presence, of absence, and of memory’. 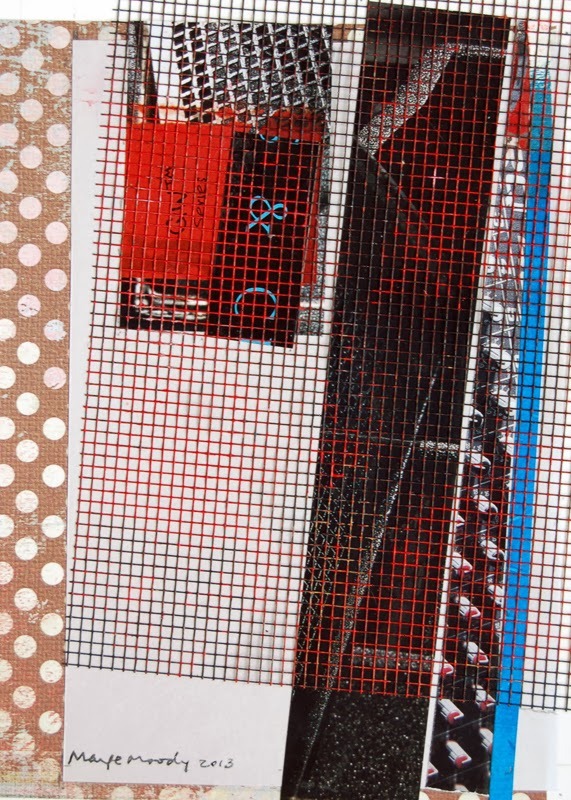 Selected small collages that span 30 years (1983 – 2013) on a variety of themes will be on view. Such themes include the City Scene series; Bird Series; Precious Threads series; the Square series and the Urban Instincts series. “By its very nature collage is an open text that, when successful, establishes an empathetic link between the artist, the image and the viewer. The subtle nature of this communication, as does conversation, is renewed with each encounter and makes significant demands on both parties. 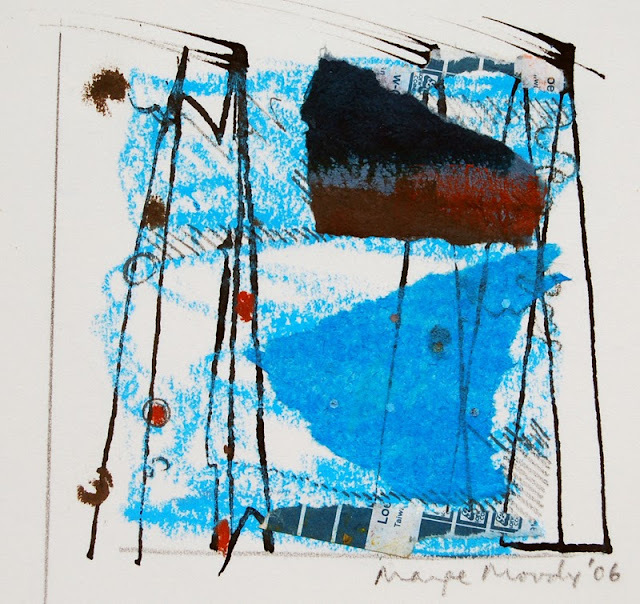 The artist must rely on a sure sense of composition to shape many different elements into a unified work, while the viewer is challenged to look beyond the convention of semblance and respond to a poetic language that often relies on ambiguity and abstraction. Outliving its modernist heritage, the collage sensibility is now the very foundation for our understanding of the world: as we read a magazine, shop, use the computer, or drive down the strip, we enter the realm of collage.